‘Space exploration’: first country, name and payload (most knew Russia, some knew Sputnik, and others guessed dog, monkey, ‘don’t know’ …correct answer was dog on Sputnik. ‘What is the preamble?’: first we defined preamble then many knew of the preamble to the US Constitution. I suggested that the words “We the People” was pretty powerful. ‘February and Calendar’: Which one do we use, Roman or Gregorian? Some knew the Gregorian and I explained that the switch was the result of the Roman night aligning properly with various solstices. Also in the Roman calendar, February was the last month and it’s meaning meant celebration, and the Roman leader declared it would be a month long celebration of the previous months. One girl, a freshman, asked if Gregorian was named after Pope Gregory. Hmm… Steve looked up the answer. That triggered a change. Now there was real dialogue. And, the kids wanted this. Steve had another idea; he asked the school kids to think of their favorite quote and write it down so he could make a list to give them. Wow. Steve has gone from asking questions to having conversations. Now, he is throwing the ball in the student’s court. He knows they’re ready. Steve said there was not much of an interest at first, then there was a breakthrough. “A high school girl used to walk by without a word, even when I would say ‘good afternoon’. Recently she seemed to take an interest in my routine of asking questions or sharing facts. She even said hello. In passing me this afternoon on the way to her bus, she stopped, reached into her bag and handed me a laminated sheet (must have been done at school today) with 9 quotes from Thich Nhat Hahn, a Buddhist monk. Apparently he’s well known. This entry was posted in Early Education, Expressing words and feelings, Inspiration, young children and tagged Asking children questions, Early Education, language development, Making a Difference, teaching young children. Bookmark the permalink. An inspirational man indeed. Perhaps he should also be teaching? I agree! And, apologies that Inhave been swamped with the end of the school year and haven’t read my fellow blogger’s posts. This weekend! Best to you, Pete. Thank you, Opher. He is a wonder! What an amazing person, someone who goes the extra mile with his job, making it more meaningful for him and the students. I love this story, wish there were more like it. He really is amazing, Darlene. Can you imagine if all school crossing guards were like that? That would be staggering. I wish there were more of these stories, too. I didn’t know that. Thanks for teaching me something too. Thank you! He is amazing. What a gift to those kids. what a nice and inspiring story. Heroes show up everywhere. I really like Steve. I ish adults had a crossing guard like him! I agree! You said it well. Thank you, Michele. good for you! You have inspired me too! I am a music teacher in a small Montessori school. thank you! I might be way off but I think that sharing some odd fact, historical info or even telling kids about something you did as a kid, yourself, gives them some brief insight into a different world and even broadens their thinking skills. Yesterday, some of the kids were amazed (and even a teacher) when I told them how tall G Washington was (6’2”) and how he compared to others. Have a wonderful day. Inspiring indeed! I love some of those quotes! You are so right, Ritu. What a guy! And the quotes the kids gave him are really impressive. I’ve printed them off, they were so good! Tutu, one of my favorites was the Jello ad about happiness. Yes that caught my eye first! Never heard it before being in the UK! We call it jelly here!!! What you call jelly we call jam lol! It’s the universal language of ‘street’!!! Cool, what a wise and great guy! Wow, this is just amazing. What a great idea and I love how this shows that even the most standoffish kid can be reached with time and even the smallest effort (saying hello). What a guy. Thank you Jennie!! Thanks. when I realized that I was their first and last contact in a position of authority for the school, my responsibility became more meaningful. The goal was to start their day with a smile and mist did. Thank you. Just amazing. It’s great to start a dialog with the kids and it’s even greater when they start teaching YOU! 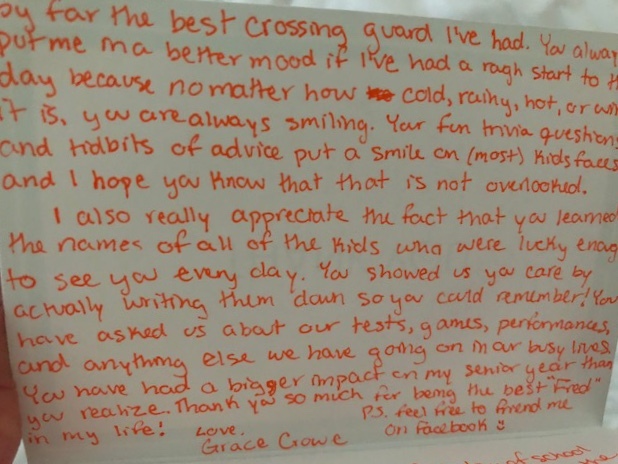 I love the statement “this girl has changed remarkably since she started crossing with me”. That just gave me the warm fuzzies. When I get the smallest smile from her, it makes my day. I remember this lovely post of Steve’s, Jennie. I shared it at the time. That post was one of my favorites, Robbie. I’m so glad Steve continued on with the children to do much more. This was a great finale to his school year. The children are so lucky to have someone who respects their brain. Thanks, Jennie. John, I have to write that down. You have no idea how profound your statement is. You are seeing this through a different lens. Thank you! I have always approached children as if they had a brain. I think it is a way to communicate on the proper level and is a trust builder. Thanks, Jennie. Now, if only every parent and teacher could see it the way you and Steve do. Of course you have hit the nail on the head. I’m fortunate to be in an excellent s hook district, John. Some of these kids are taking classes now that would have been college classes ‘back in the day’. Jennie, I’m at a loss as to what to say and how to thank you (unusual for me). It is such an honor to have you write about me in your blog. And let me tell you about the influence you have had on me, and surely others. Part of what I do with the kids at my school crossing post just comes naturally because I saw my father, rest his soul, do it whenever he had the chance to be with young people. And a big measure of what I do is a result of reading your blogs and seeing the impressive work you do with your young students. You are a terrific example for being ‘positive’. As I’ve told you, if I had to do it again, you’d be my teacher. Your energy and creativity is unlimited and your enthusiasm for being a positive influence on kids (and adults) knows no boundaries. Thank you for ‘sharing me’ with your followers, Jennie. Very nice words from you and Charlotte. When you’ve been around long enough to look back at your life, as I have, it’s rewarding to know that, for some brief period of time, you had a positive influence on someone. Let’s keep doing what we’re doing! Happy writing, Jen! Jennie, I did read the comments and they were wonderful. I have to control my ego (kidding). Would it be appropriate to address them? What a great way to turn an ordinary job into an extraordinary experience. I’ve tried to keep this up throughout my career. It makes work fun. Excellent way to put it, Dan. And it has been a great experience for me, too. Well said, Diana. He does it all. What a real hero! Thanks, Diana. The Woodchuck day was fun. My pleasure, Steve. You’re an inspiration. You are so right, Marlene. It’s the Steve’s of the world that give us hope and inspiration. Wow! What a neat thing to do, and extraordinary man! Such an inspiring post, Jenni. I remember your previous post about Steve. What a remarkable man. The number of lives he has improved must be enormous. He has a huge heart. I love the fact that he not only continued, but grew all he did. This was a pleasure to write his follow-up. I can only imagine what September will be like on his corner. Yes, Steve has improved lives. He’s a gem. He is a gem in a million. How fortunate are those whose lives he has touched. Thank you, Norah. I think I just started to realize the small but positive influence I’m having on the kids. And they’ve made it a pleasure for me, as well. That’s a good thing about kindness, Steve. It’s like a bottomless well – the more you give out, the more you receive. It has no limit. Many of us learn wonderful lessons from your generosity of spirit. Thank you for making our world a better place. Norah, thank you for those nice words. Very nice sentiments to read first thing in the morning. Have a great day! He really is, Tina. I’m amazed at the quotes. I was way behind that eight ball in high school. Well, I didn’t have a teacher or crossing guard like Steve. Thanks, Tina. Steve sounds like a wonderful guy. As I say about you, the children whose lives he visits are quite lucky. Hugs on the wing! This is incredible, Jennie – thank you so much. I’d like to share this post for #ForgivingFridays, is that ok? I love the focus on opening dialogue and creating honest and loving connection. I love your blog. So happy to know you. Happy Sunday, Jennie! Oh wow. He is an inspiration to all of us! If we could all take the opportunity to create meaningful dialogue with other people, especially kids, this world would be a better place. Thanks for sharing. Well said, Dayne. Thank you! It gets harder and harder to be Steve every day….May we all aspire to anyway!